Paper Marbling: what is it and why is it in trouble? 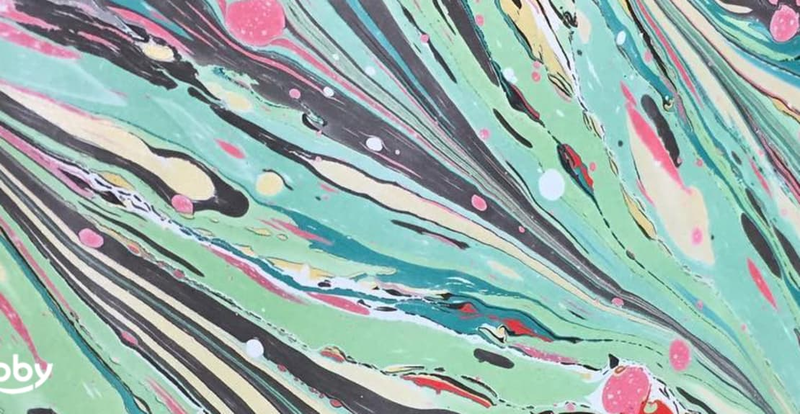 Paper Marbling in London is named as a critically endangered craft, so we look at where we can learn how to do it, and save the ancient crafts! According to wikepedia.org paper marbling is a method of 'aqueous surface design, using ink in water, creating a marble like effect'. This is then transferred to paper or an absorbent fabric to create stunning designs. It has a close association with the art of bookbinding and calligraphy as it is often used as a writing surface or book covers. The idea is, that with a lot of skill and concentration involved, it creates fantastic and bold monotype decorations. No two are the same, that is what makes paper marbling such a distinct and special form of art. Unfortunately this year the Heritage Crafts Association has labeled the craft as being critically endangered, due to issues they say to have affected it, such as digital printing, less traditional bookbinders and an abandon of marbling houses, where apprentices would have been trained. This has meant there is a dwindling supply of trained marblers. However, we do have 2 of the remaining 3 in the U.K as teachers on Obby. Lucy Mcgrath of Mamor Paperie and Freya Scott of Paperwilds are both extremely talented teachers, who run paper marbling workshops in London. Freya, from Paperwilds, another school that teaches the ancient craft of paper marbling, has been a bookbinder for eight years. She also uses her crafts to do good, at Bound by Veterans. This is a charity that uses paper marbling workshops and bookbinding as a part of rehabilitation for sick veterans. They both work out of London, meaning it is very handy for any that lives nearby who fancies dabbling in the art (quite literally.) It's a shame to see such a stunning art become endangered, so here at Obby, we are doing all we can to encourage the girls to keep doing what they do and promote their classes in all the right places. It would be a tragedy to see paper marbling go from critically endangered to extinct, so it's important that as a society, we support people like Freya and Lucy, who work so hard to keep it alive. Luckily, there is support from within as well. The International Marbling Network is dedicated to the preservation and promotion of the art of marbling. Through sponsors and events. they are doing all they can to promote the safety of this beautiful craft and keep art alive.